Every year, around this time, I struggle with the same thought: gifts. Again. Sometimes it feels so wasteful and unnecessary. I usually leave it until the last moment and then just buy some crap no one needs, just so I have a present to gift. This year, though, I did things differently: and also bought sustainable gifts! Be mindful. This year I started my Christmas shopping really early. In fact, I’m already done and it’s not even December yet. And you don’t know how good this feels. Knowing that I’m done. More than that… knowing that for the first time I really put a lot of thought and effort into it. Make a plan. This was the part that required most work. I really took my time and thought about each person and what they would like to get. This was also kind of lovely: to sit with a notepad and to think about my family and friends, one by one. Splurge. This is a difficult one. Sustainable gifts do cost more. Much more than their “standard” equivalents. But hear me out: growing up in Russia we didn’t have many things. Not in homes nor in the shops. Gift giving was a form of art. I was raised with very clear gift-giving guidelines: choose the best you can afford; gift something you would wish for yourself but would find it too frivolous to spend money on. Today we have an abundance of stuff, in our homes and in the stores. So what is a gift but a luxurious experience? “My budget is not that big”, you might say. Well, mine wasn’t either. But if the present that I want to give someone ends up being too expensive, I say: “This is your Christmas AND Birthday present”. Believe me, anyone would rather get one good gift than two crappy ones. No money? Not to worry. Sometimes things are tight. Don’t run out and get a cheap plastic present just to give something. YOU are a gift. What can you do well? What would your friend need some help with? Sit down and make a list of things you can do well like baking, financial advice, graphic design, etc. Make a “coupon” with your talent on it and gift it. Ta-da!!! Best gift ever, trust me. Is it ok to start with a gift to yourself? Yes, I think so. In fact, try and buy a gift for yourself first. You know how when you fly on an airplane, the flight attendant instructs you to put your oxygen mask on first, before helping others. Why is this an important rule for ensuring survival? Because if you run out of oxygen, you can’t help anyone else with their oxygen mask. It’s time to let go of the guilt and the excuses and put your oxygen mask on first by… getting yourself a Christmas gift. Hey, it’ll also put you in a festive mood for further shopping! 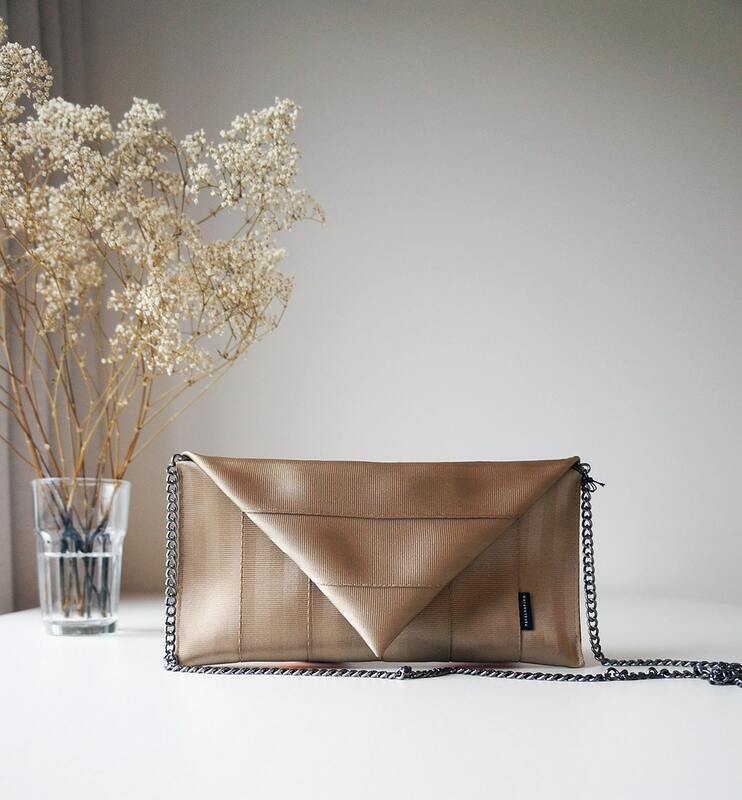 Here is my gift to myself: the gold clutch by Pekelharing. HO HO HO, Merry Christmas! Karin Pekelharing makes these amazing bags from used car seatbelts. 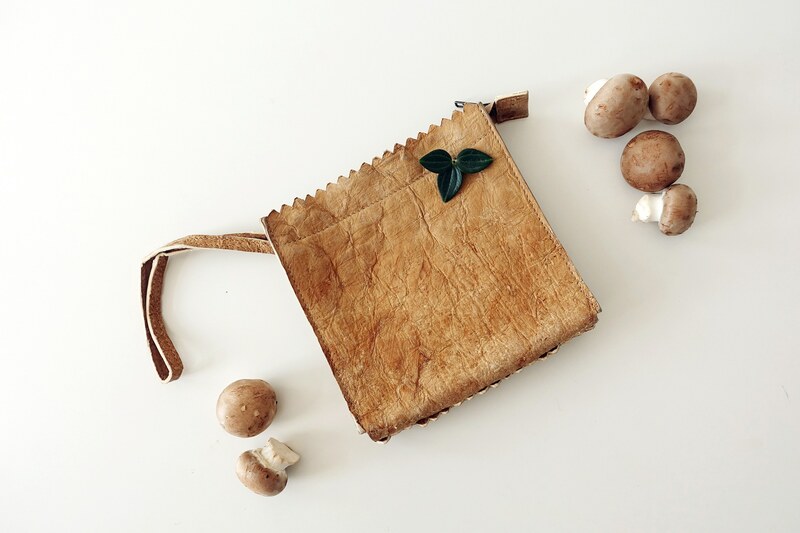 One of my favourite sustainable bags labels. And they are made here, in Amsterdam. 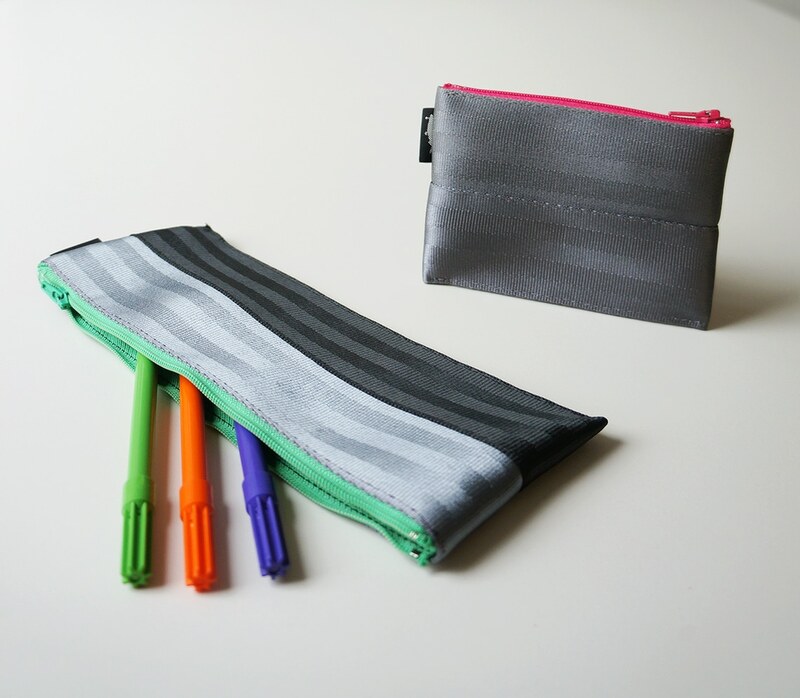 Karin Pekelharing, using her magic touch, has turned a pile of old seatbelts into sturdy and beautiful pencil cases. These can carry your cards, pens and medicines, keeping all your small items from flying around your bag. Julia’s designs are some of the most breathtaking I have seen in a long time and my photography skills really don’t do it justice. Her inspirations come from all shades of nature. The real and the raw. The subtle and the soft. The pure. The wild. 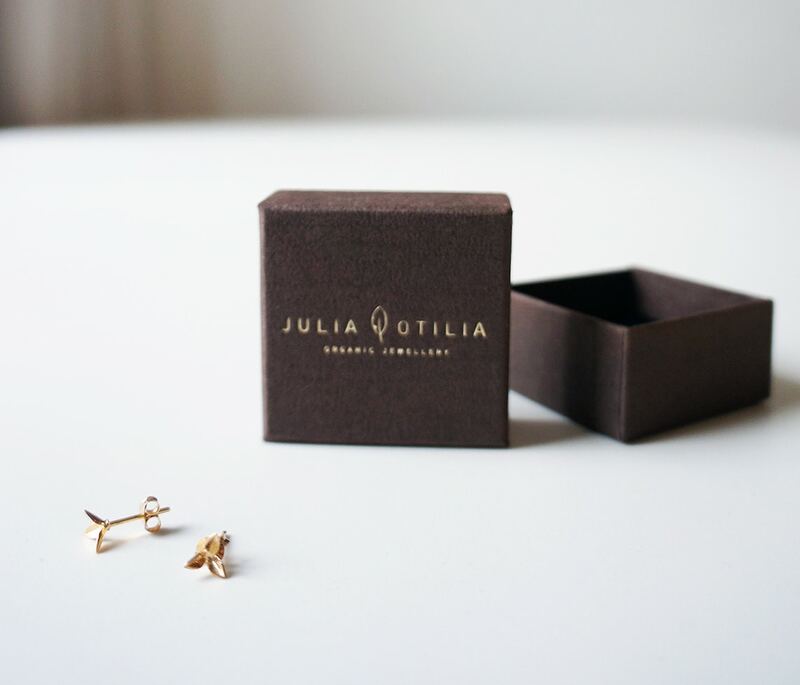 Julia’s jewelry reflects all that and more. Like Julia herself, it’s gentle, almost fragile but somehow strong and peaceful at the same time. All this is done using sustainable materials and with attention to the environment and her surroundings. Have a look at her beautiful jewelry here and you will see what I mean. These hammam towels are the real deal: made in Buldan, Turkey in a generations-old family weaving mill. Cor, the founder of Happy Towels, combines his love for Turkey with his passion for quality and sustainability. How innovative are hammam towels? Hammam towel is not a new concept, but Cor improved the sustainability and durability of these towels by using organic cotton and bamboo yarn. He also adjusted the dimensions of the towel: the generous length of 210 cm allows us, the tall Dutch people, to use it as a mat to lay on outdoors. No more grass tickling your feet or your neck. 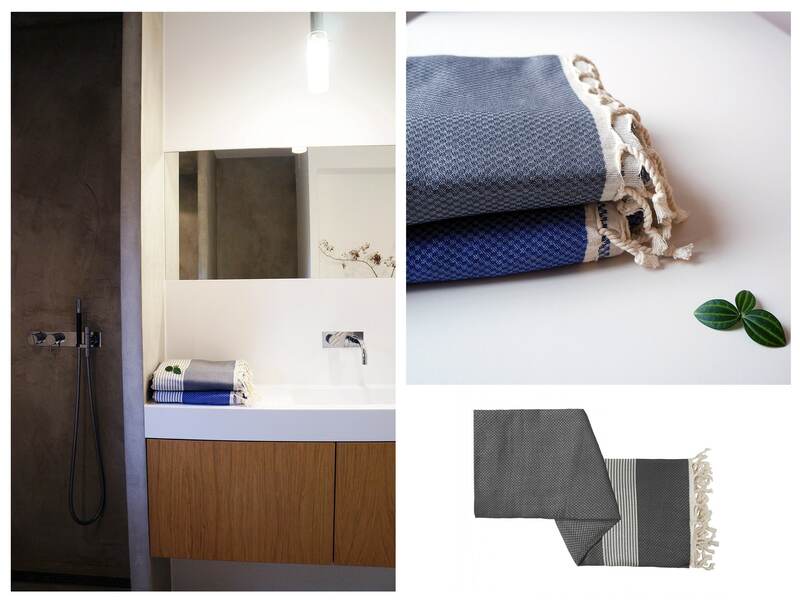 Hammam towels are robust, durable, soft, light and quick-drying. Aside from in the bathroom, a hammam towel can be used as a scarf, a summer throw, a picnic blanket, a gym towel, and a yoga mat cover. With their plaid finish and elegant designs, hammam towels have a distinct summery flair so can even be used as a tablecloth. It was hard to choose a favorite color, but these two have caught my eye and now I think I’ll have to get the grey one for myself, as I’ve fallen in love with it. Auryn Jewels were founded by Denise Zatti, whom I met at Pause (a sustainable pop-up store) a few months ago. What struck me most about Denise is her wholehearted approach towards design and sustainability. 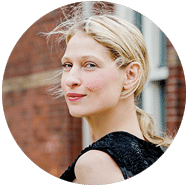 Her designs are intertwined with consciousness and appreciation of what we have and the knowledge that behind every piece of clothing and jewelry stands a human who has made that for us. I’m drawn to the simplicity of Auryn designs. There’s something Aztek about them but interpreted in a very clean modern way. Karim Eharruyen is an artist that works in an ancient sawmill in Utrecht. Karim’s wood lives. Each piece has its own history, a story that is reflected in the growth rings, the grain and the knots. Like a human being, every wooden object, therefore, is unique. Karim nurtures these stories with compassion and lets them flourish in his objects. He works exclusively with timbers from sustainable locally grown wood species. When possible, he recycles wood and gives it a new life. Because recycling materials often have rich stories to tell. And recycling reduces the impact of the production process on nature. 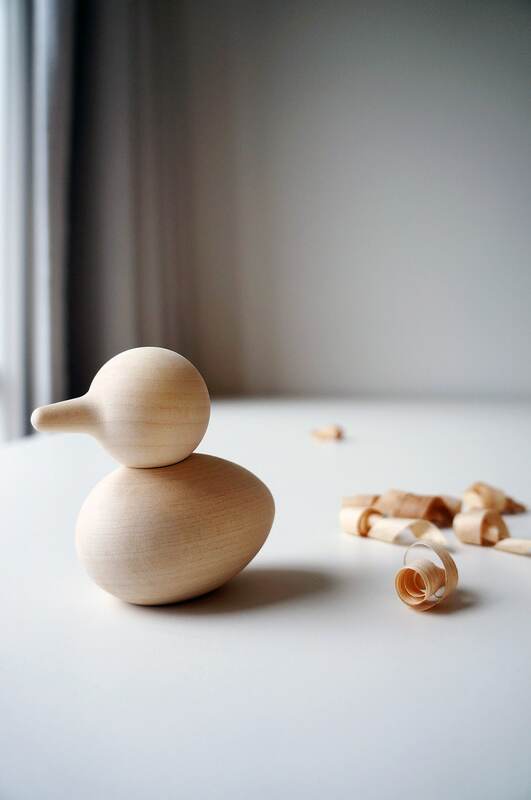 He invites you to play freely with the objects, feel the shapes and arrange them as you please. Give your own DRAAJ (twist) to them. 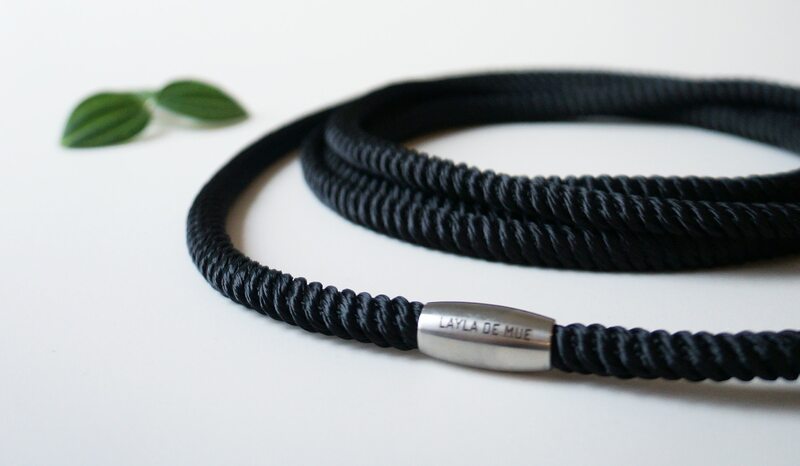 “Knothingelse” is a part of a Berlin fashion label, “Layla De Mue”. I just love this name: “Knothingelse”: Layla makes such pretty statement necklaces out of eco-certified viscose cord, twisted in different knots. The inspiration for the jewelry collection “Knothingelse” came from Layla Mueller’s father, who as a stage master is dependent on ropes as well as reliable knots and knotting techniques to secure him at 30 meters above the stage. Statement necklace by Knothingelse, € 49,00. The necklace is available in 6 different colors: gold, grey, copper, berry, navy, black. For an order go here. The most amazing thing about this necklace (besides how light and silky it is) is how it can be worn in different ways. 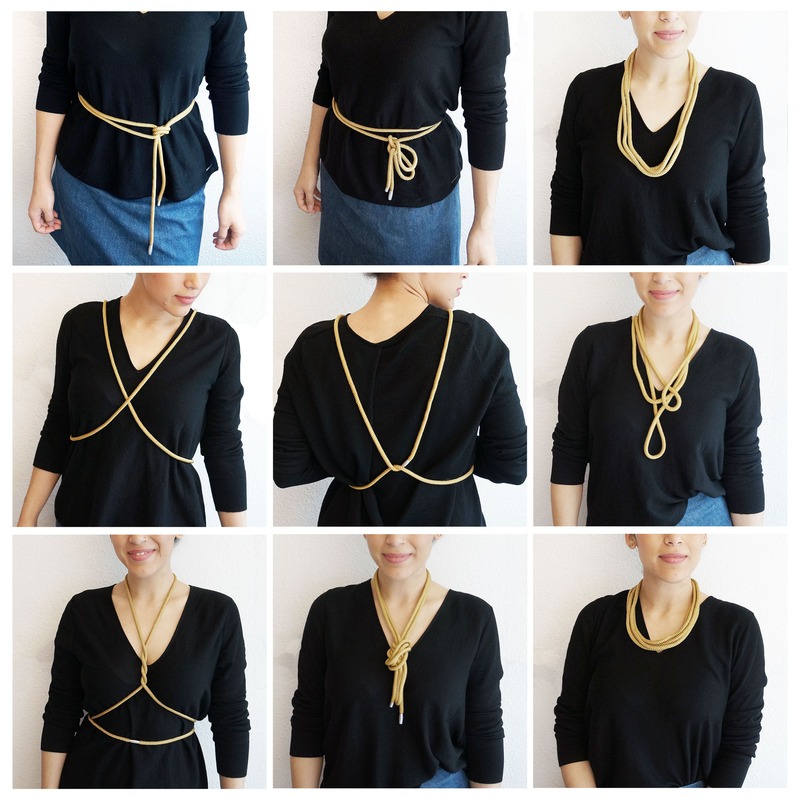 This present is 10 necklaces in one, which makes it one of the best sustainable gifts! Oh, and I think they look absolutely gorgeous in our bathroom. 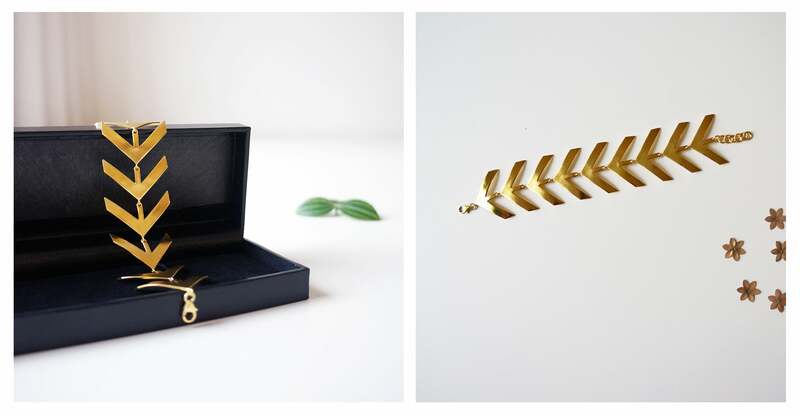 Suz creates minimalistic easy-to-wear everyday jewelry. 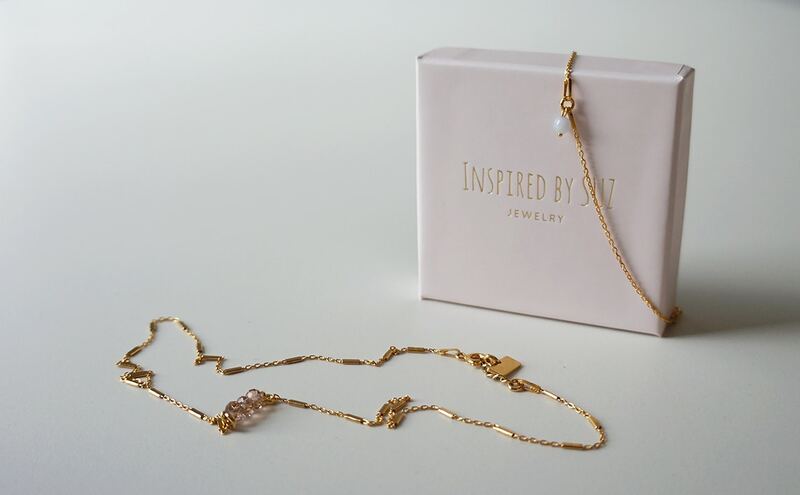 All jewelry is lovingly made at the Inspired by SUZ Atelier in Amsterdam from pure materials, 925 sterling silver, 24k gold and natural gemstones. 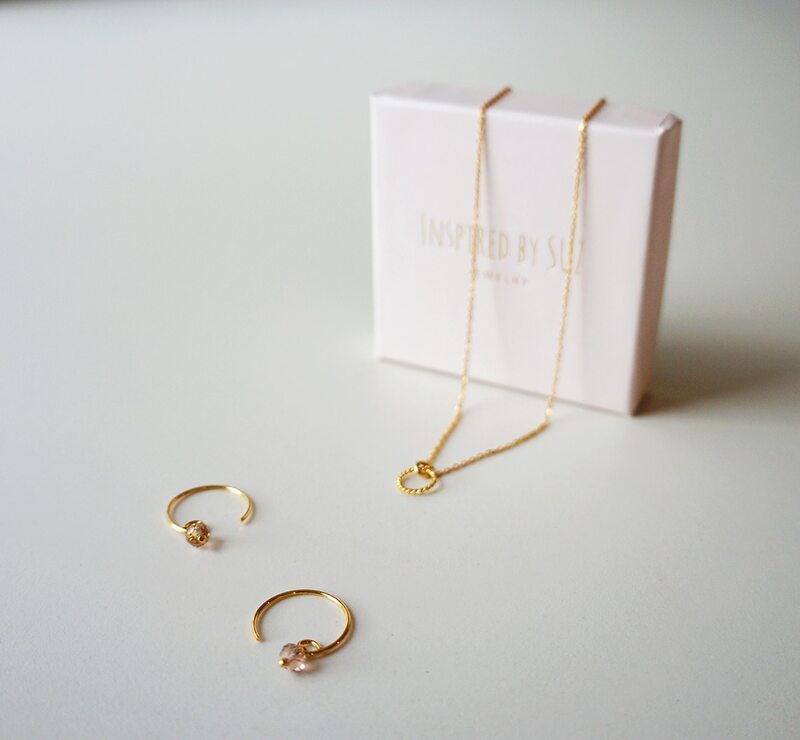 Influenced by her education in Art History, Inspired by Suz jewelry pieces are like tiny compositions of geometric shapes and soft color tones. 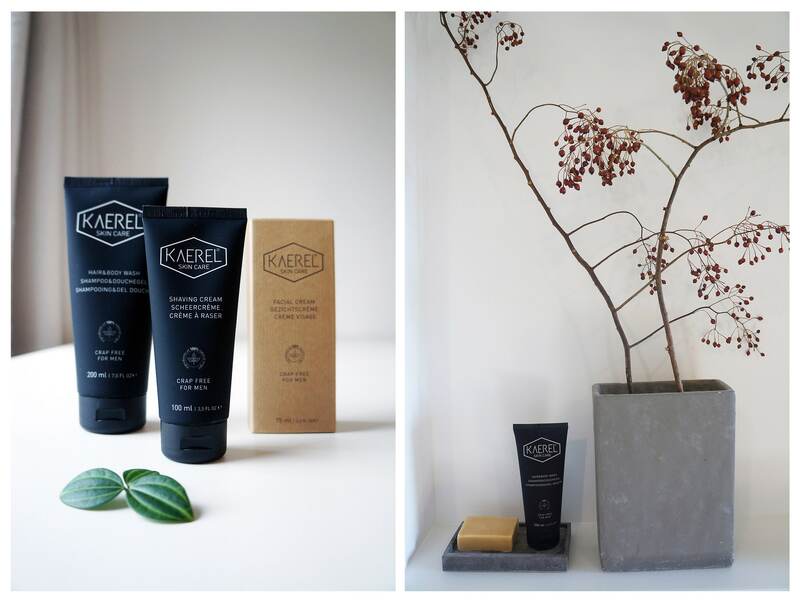 These little beauties: perfect sustainable gifts for my girlfriends. Remember what I told you about the Russian way of only giving presents you would absolutely love to use yourself? That’s how I feel about Inspired by Suz jewelry: happy to wear it myself. Simple. I usually save gifts throughout the year because it’s easier to find deals and you aren’t rushing last minute. But this year…I don’t know…I was just off. So I still have a bit to get. I love all of these ideas though. Beautiful! I always have the intention to buy gifts through the year… but somehow I never do. or I do and then I forget them and find them years later in a back of some closet. I want to try and do them even earlier next year to utilize the Black Friday sales. A lot of sustainable brands do BF sales as well. I love everything that you have on this list. Thankfully, since I’ve gotten older, I have become more mindful of sustainability in all aspects of life. I may need to drop some hints because I’m pretty positive that I need that clutch in my life. Who would have ever dreamt of a purse from seat belts, I love it! Agree, Sami! I think this is the first year I actually enjoyed shopping for Christmas gifts since I took this mindful approach. I am usually one who needs a big purse, but that clutch is gorgeous! Not only are these gifts sustainable, they’re also all stunning pieces. I have never heard of any of these lines so I liked learning about new artists. I’d be proud to give (or receive) and of these gifts. Thank you, Julie! I really try and search for brands that do things a bit more different and that catch my eye (in the sea of new brands popping up online all the time). I know! Right? And the coolest thing about it (besides the color) is the fact that you don’t see that it’s made out of car belts and then you like “oh!”. I think Pekelharing Bags are doing this cool thing now, where you can send them the seatbelts from your old car and they’ll make a bag out of them and will send it back to you. I think it’s so nice to have this nice memento with you even after you say goodbye to the car. And it’s surprising how big the bag can be from one car (a tote)! That first bad is gorgeous! I’m going to Amsterdam after Christmas and may have to check them out. You should! You can even visit her studio, it’s located near a beautiful park: Westerpark, with a lot of cafes and little independent artist studios. These are some great picks, I can’t believe that clutch is sustainable!! Its so pretty, thanks for sharing! You are welcome, Krystin! I also couldn’t believe what the clutch was made of until I came closer to it. Oh I cant wait to check happy towels out more! you totally should! They are very nice! I have changed my gift giving this year and am looking more at quality vs quantity. Most of the folks I buy for are well able to buy themselves what they need but I want to gift them something like you said that they wouldn’t buy themselves. My thoughts exactly. As we grow up, we are able to afford more and everyone around us has more and more things, so every year it’s a struggle to come up with a nice original present. That’s why this year I wanted to approach the present buying business differently.